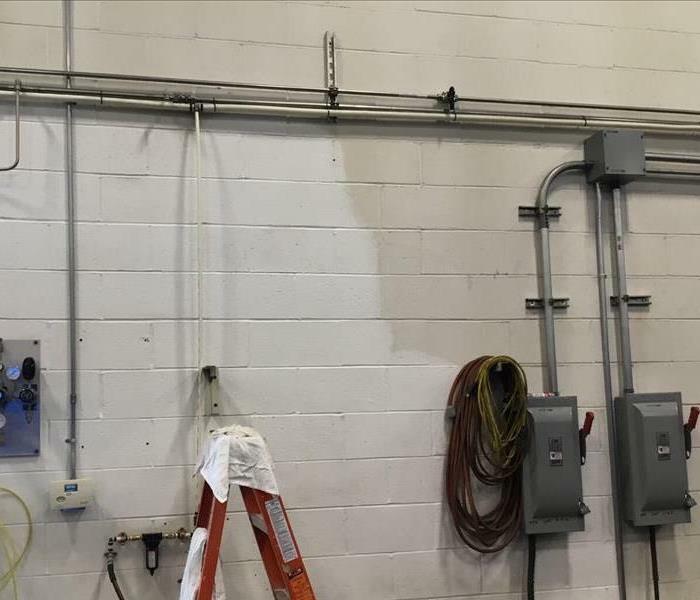 After a fire due to vandalism, we worked with this company to complete their fire restoration in a warehouse that has ceilings over 16 feet high. The best compliment though? 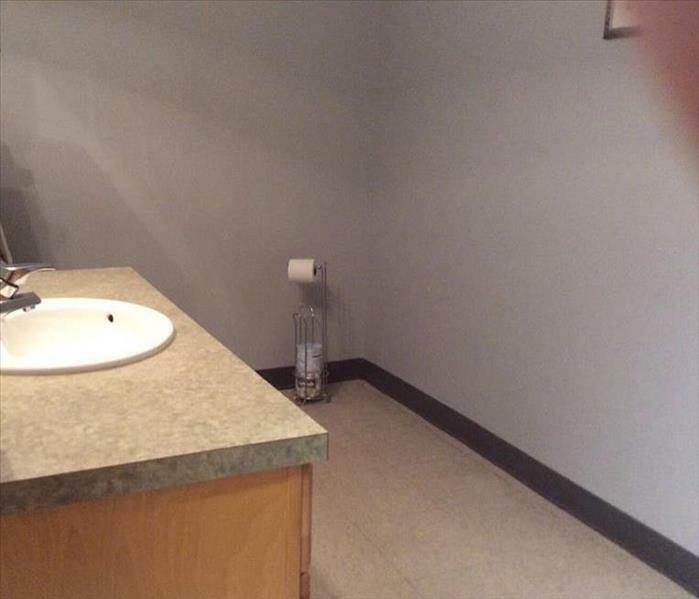 6 months after we were finished, someone came in to inspect their fire extinguishers and asked if the place had been cleaned, because it looked better than ever. Also, one of their customers who travels internationally auditing the different manufacturing companies stated it was the cleanest shop they had ever seen! 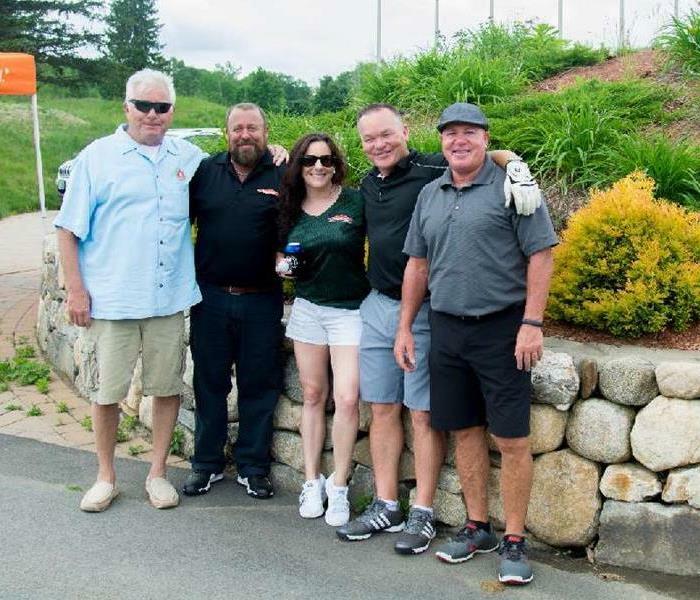 In this photo, several of SERVPRO community teamed up with the Lawrence Fire Department and adjuster to raise money through golf in support of the Michael B Christianson Center for the Prevention of Child Abuse. Through the Salem, NH Exchange Club, Nicole Shepley, current President, not only helps plan and arrange this event, but also golfs! We are grateful for all they do! We appreciate our Emergency Personnel in all the communities we serve. 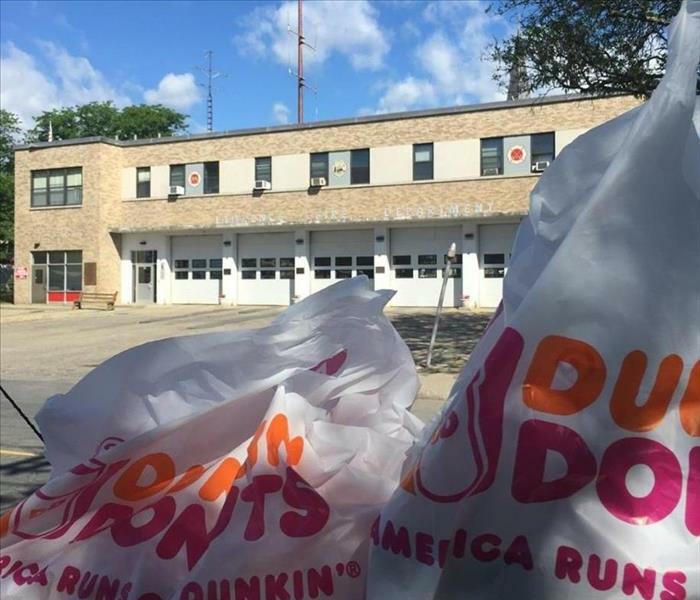 We try and show our appreciation by bring them breakfast after particularly long nights of saving our towns. They are always the first on the line in any sort of emergency, and we are grateful for the lives they save. 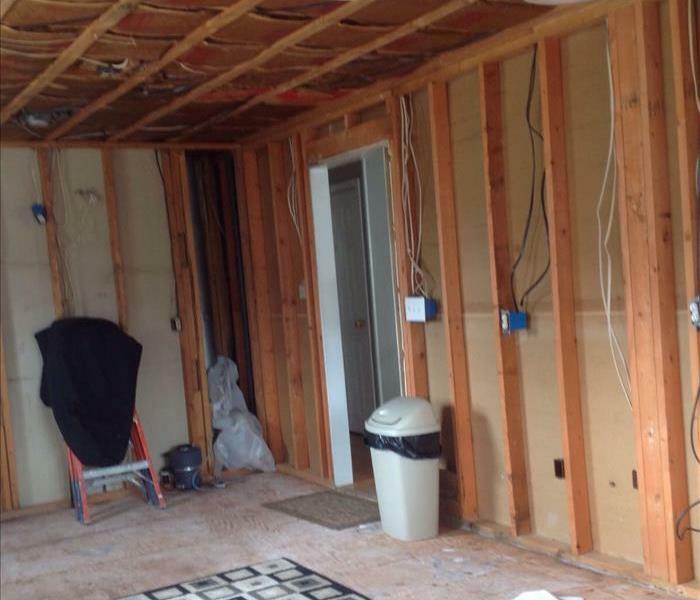 When we are completing demo at your home or business, we know there may be custom pieces that you don't want ruined or maybe can't be replaced. Such is this built in cabinet. Our teams were able to carefully complete their demolition around it so that when the reconstruction is finished, it will look like the cabinet was never disturbed. 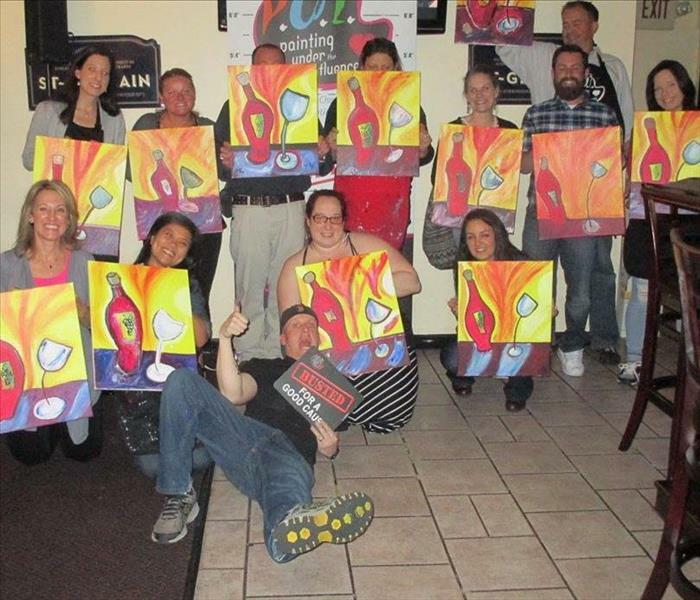 SERVPRO of Lawrence loves to support local businesses in their new adventures! Congratulations to Battle Grounds Coffee Co. for opening their second location on Merrimack St, in Lawrence, MA. As a veteran owned, woman owned small business let us all show support! 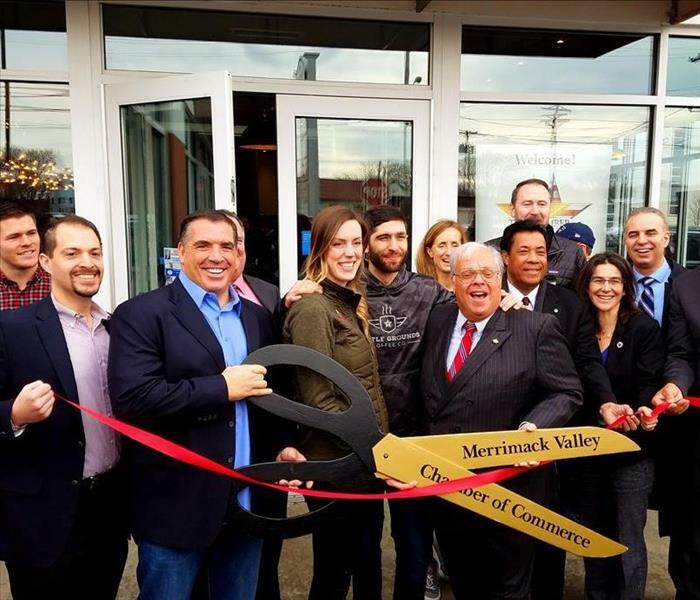 Visit their new location in Lawrence or their original location on Washington St in Haverhill, MA. Learn a little more about them on their website. We are in the midst of an extreme heat warning. It is important to keep all of your family, neighbors, pets, and community safe. For many, that will mean keeping the air conditioning running. If your ac leaks into your home make sure to call the professionals to get you back in your home as soon as possible! SERVPRO of Lawrence helps you make it "Like it never even happened." 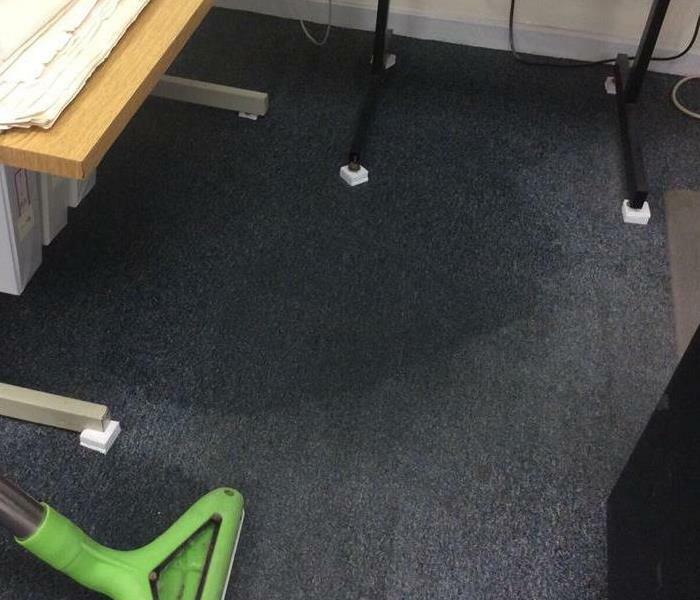 When furniture is left on damp or wet flooring after a water damage, it can produce stains, as seen here in the picture. When we arrive to help mitigate the situation, we put blocks and pads to lift the items to keep them from sitting on the wet areas and protect the flooring. 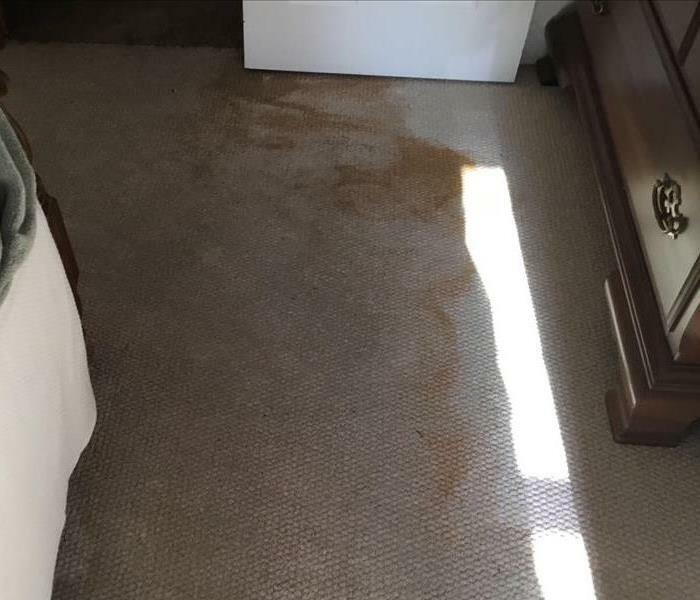 Sometimes these stains can be removed during a carpet cleaning while other times, the insurance or customer may choose to remove the carpeting. 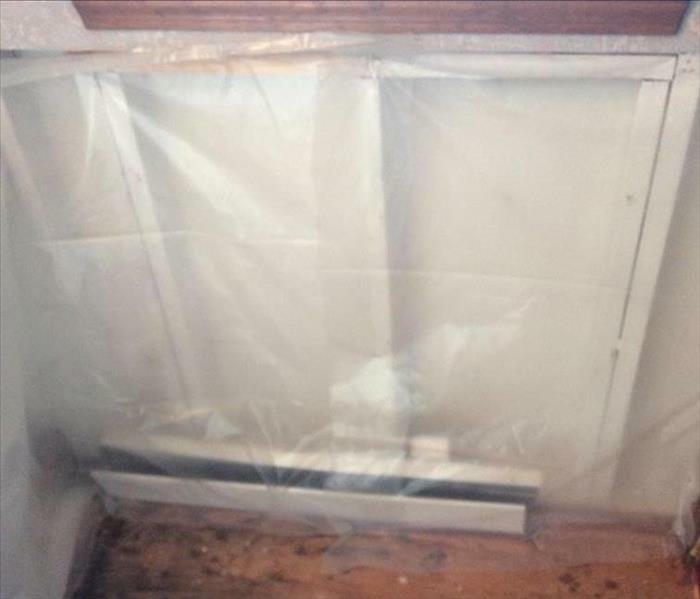 When working in your home or business, we will do our best to contain the situation, literally! 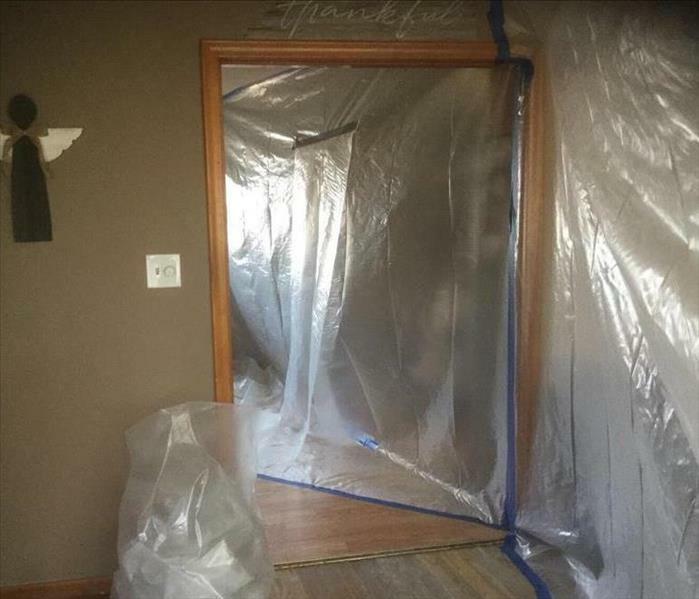 In order to not create dust in other areas of your home, or protect other rooms from mold contamination, we set up plastic barriers. These can be attached in one of several ways to cause little to no secondary damage. 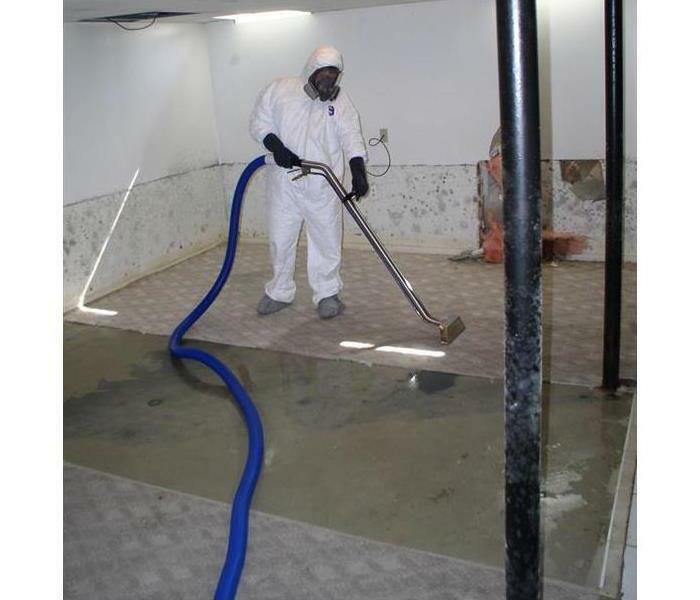 We are still able to come and go from the work area without disrupting the contaminated area and leave you worry-free. In the event of an emergency, the Emergency READY Profile® or ERP can help minimize business interruption by having an immediate plan of action in place for your facility. Working with SERVPRO® of Lawrence on an ERP will provide you with a comprehensive document containing critical information about your business, including emergency contact information, shut-off valve locations and priority areas. Here Bill is taking the necessary photos for the profile of one of our commercial customers. We do our best after any work to make sure your home is clean and ready to move on to the next stage. Whether it is a rebuild, or moving furniture back, we want to make our process "Like it never even happened." Winter is coming...words we don't want to hear, but are true. One thing to remember is that you want to do anything you can to prevent ice dams and frozen pipes. This Old House wrote this article to help you do just that! Have a safe and happy winter! We do our best to not leave trash behind at your home. Instead we utilize dumpsters or Bull Bags that are set up onsite, and then removed within 48 hours of a pickup scheduled. 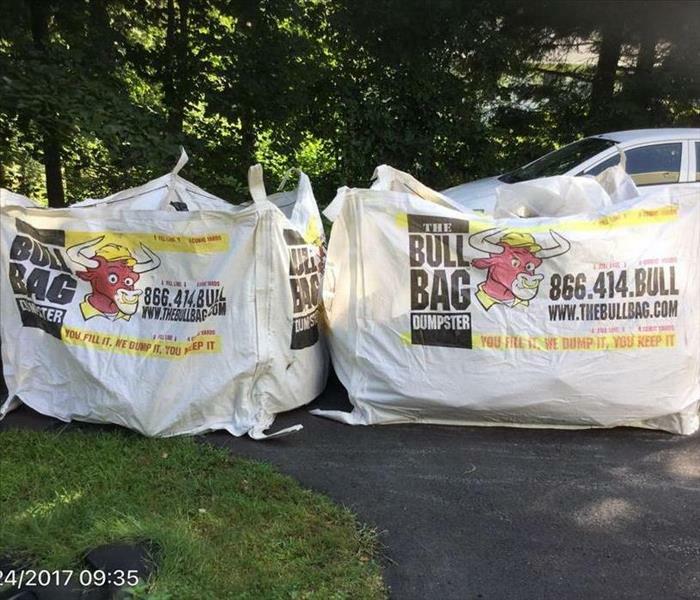 Bull Bags offer the option of being on your grass or driveway, but leave behind no damage. The material allows for water to flow out keeping your grass watered during the summer and helps prevent burned grass. For more information on how SERVPRO of Lawrence can help you, please visit our website or call 978-688-2242. When mold invades your home, it can be unhealthy and intrusive. Knowing how to handle it is always the first step. 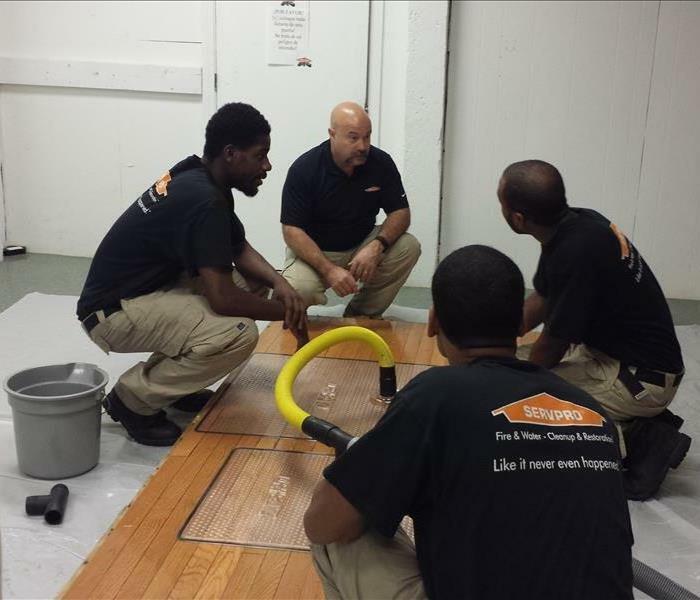 SERVPRO of Lawrence is certified to remove microbial growth in a timely and efficient manner. Call us today if you suspect mold and we can help you make it "Like it never even happened." When you need it done right and done fast, call SERVPRO® of Lawrence for all of your commercial cleaning or emergency needs. 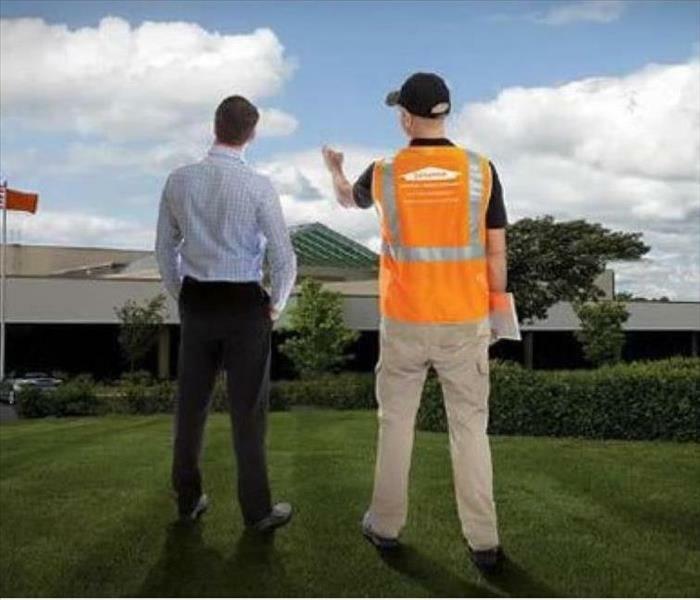 Did you know when you hire SERVPRO® of Lawrence for maintenance cleaning, you get around – the-clock restoration services built with you in mind? Quality cleaning and quick response – that’s the SERVPRO® way. 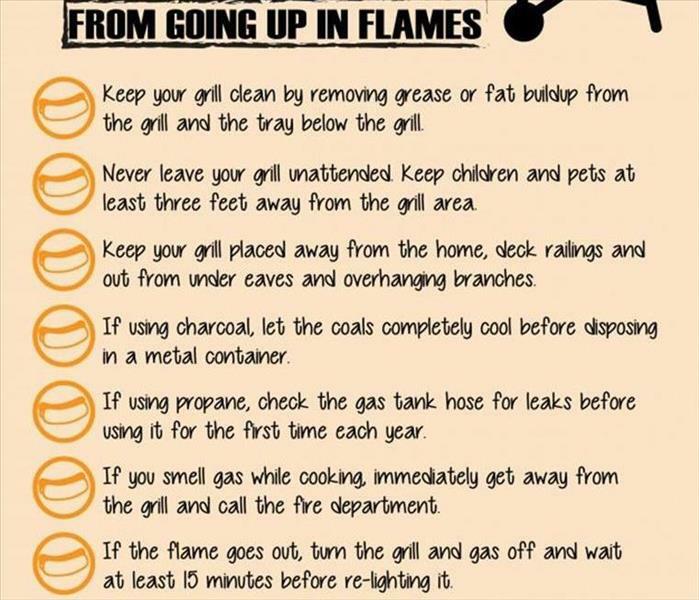 SERVPRO of Lawrence Wants You to Stay BBQ Safe! We all love a good cookout, but safety is most important. 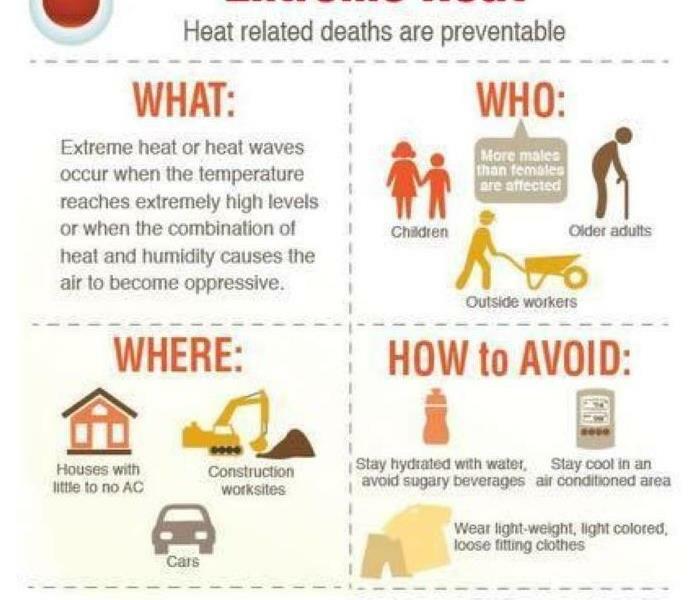 Please stay safe this summer by following the safety tips listed here. 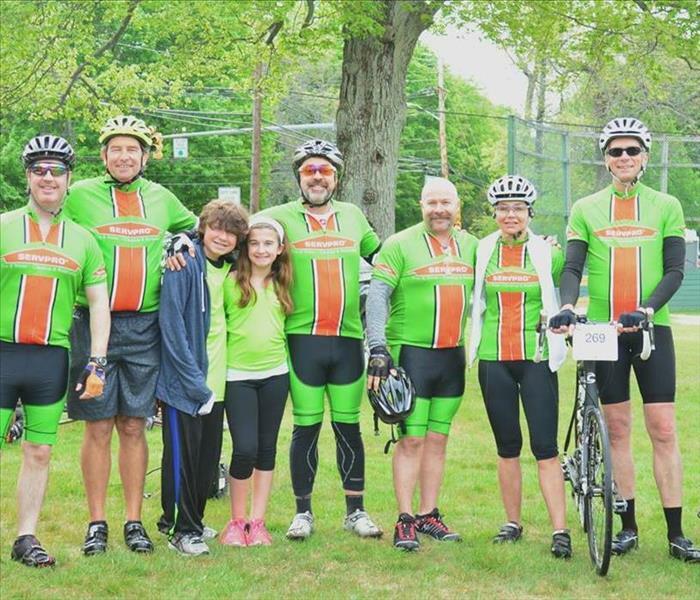 Thank you to all of our riders and volunteers for participating in this year's SERVPRO team for the Tour de Cure to benefit the American Diabetes Association. "Thank you so much for your tremendous support of the North Shore Tour de Cure! Your passion, commitment and energy made the Tour a huge success. We couldn't have done it without you!" If the unthinkable happens to your home, allow SERVPRO of Lawrence to help quickly turn your "before" into a "happily ever after." Call today at (978) 688-2242. When Fire Strikes, A Plan is Always in Your Hand. Mold is no match for us. 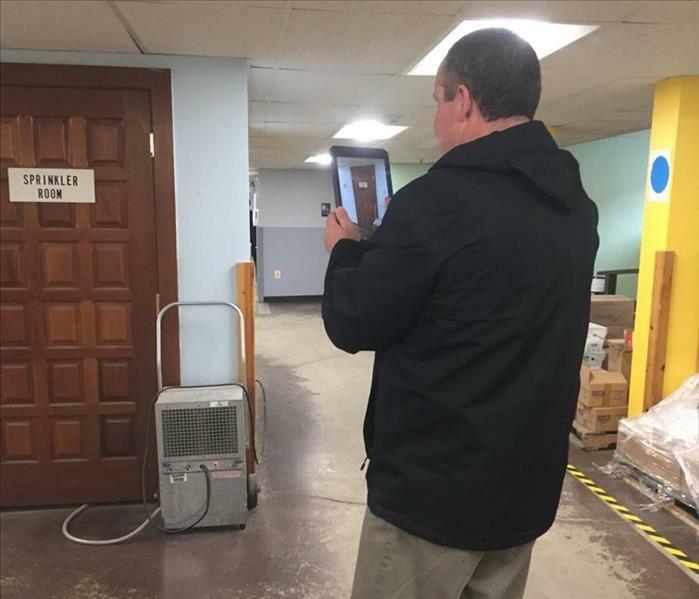 At SERVPRO of Lawrence, we are #heretohelp and use advanced water detection equipment to locate the source of the problem and remediate any mold or water damage. Spring showers do bring flowers, but they can also lead to severe storms and the flooding of your home. At SERVPRO of Lawrence. 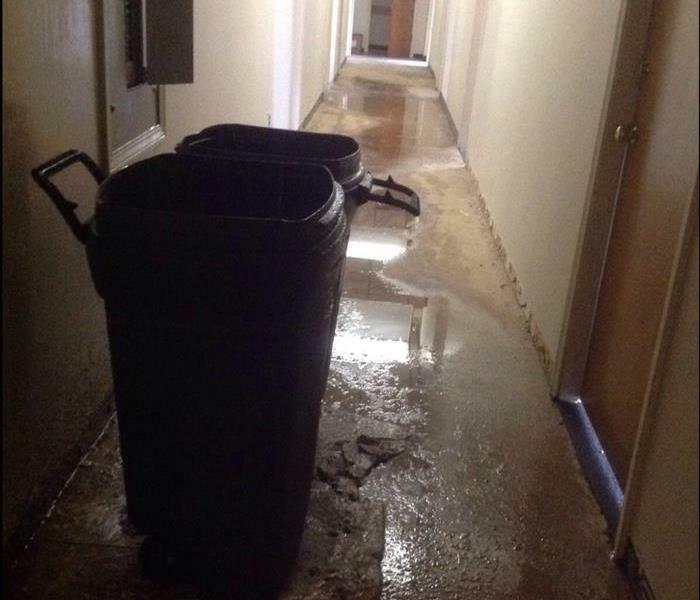 we’re #HeretoHelp mitigate the resulting water damage of your home to keep your shelter sturdy and safe. 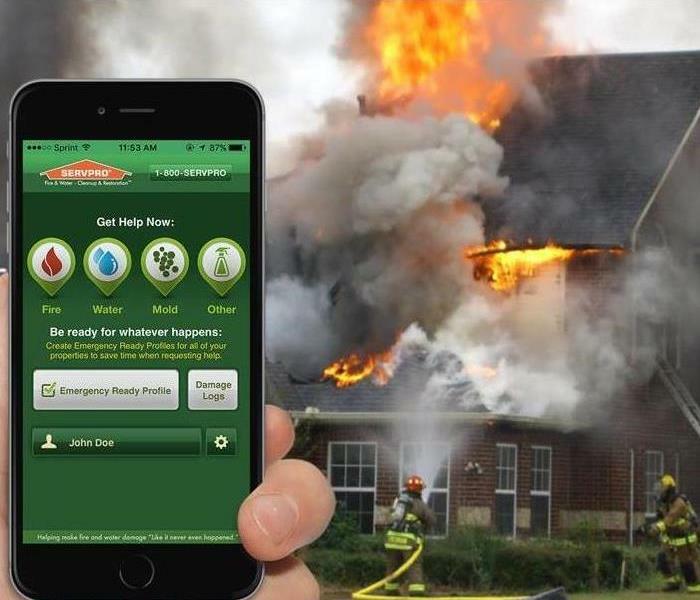 SERVPRO of Lawrence provides 24-hour emergency service and is dedicated to being faster to any-sized disaster in the Lawrence, Methuen, or Dracut areas. We can respond immediately to your emergency and have the expertise to handle your restoration or cleaning needs. 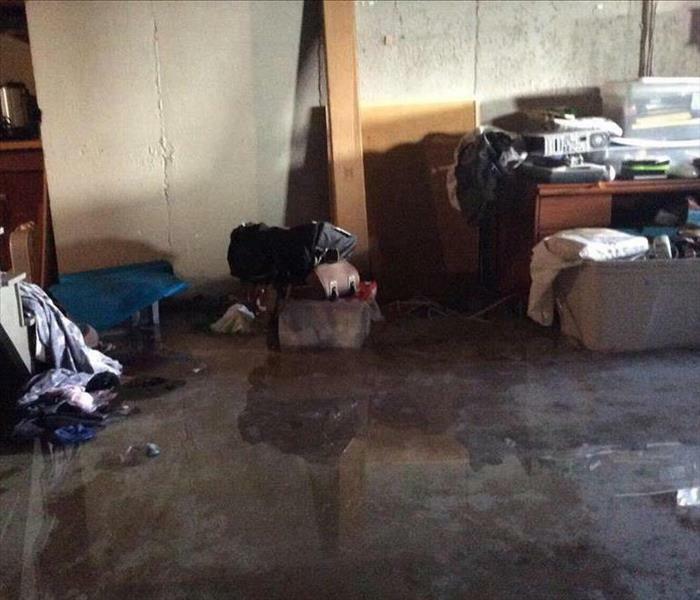 This photo represents water damage from a a sump pump failure in a customer's home. There was standing water as shown by our crew chief stepping in the water. We cleaned and disinfected the area. 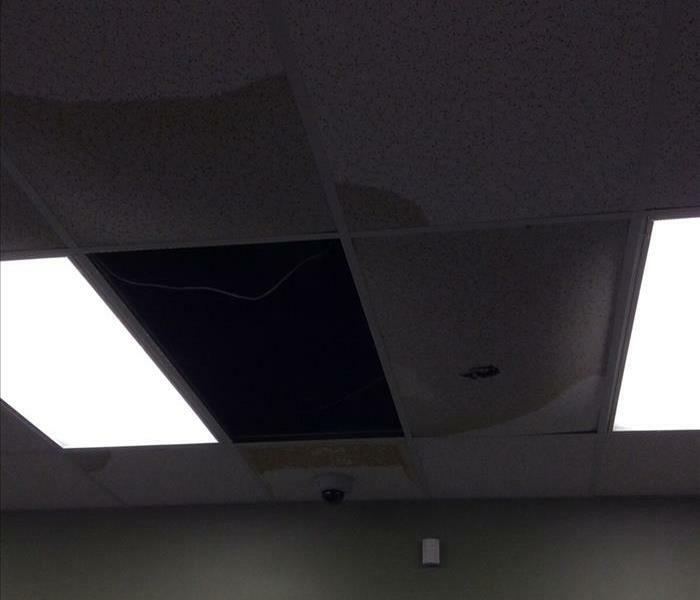 The customer was very happy that we provided all necessary measures to prevent mold. We were in and out of the customer's home in a matter of days, which helped them return to normal. In many cleaning and restoration situations, immediate action is needed. Water is particularly invasive, quickly spreading throughout your property and being absorbed into floors, walls, furniture, etc. SERVPRO of Lawrence arrives quickly and starts the water extraction process almost immediately. When storms hit the Lawrence area, we can scale our resources to handle a large storm or flooding disaster. We can access equipment and personnel from a network of 1,650 Franchises across the country and elite Disaster Recovery Teams that are strategically located throughout the United States. 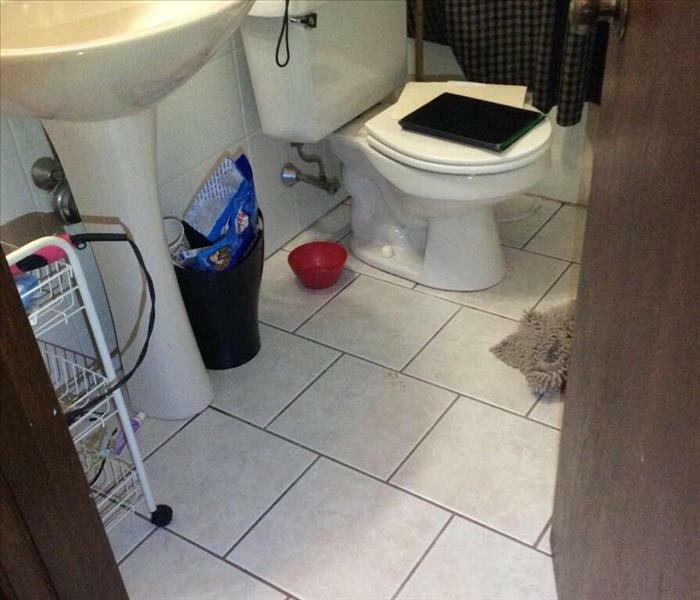 This family’s Lawrence home suffered serious damage after a recent pipe break. 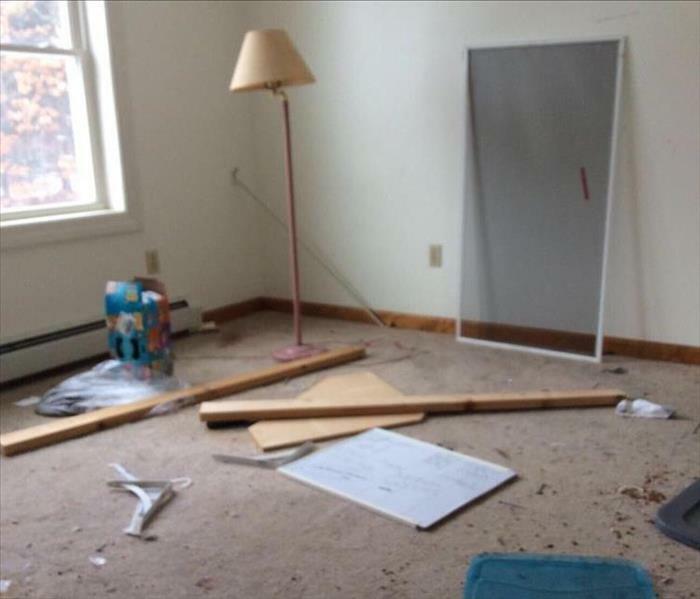 Thankfully they called SERVPRO of Lawrence and we were able to help them and several other Lawrence families clean up debris and restore the property to prepare for a remodel. The homeowners were grateful that our 24/7 services were available to them in their time of need. 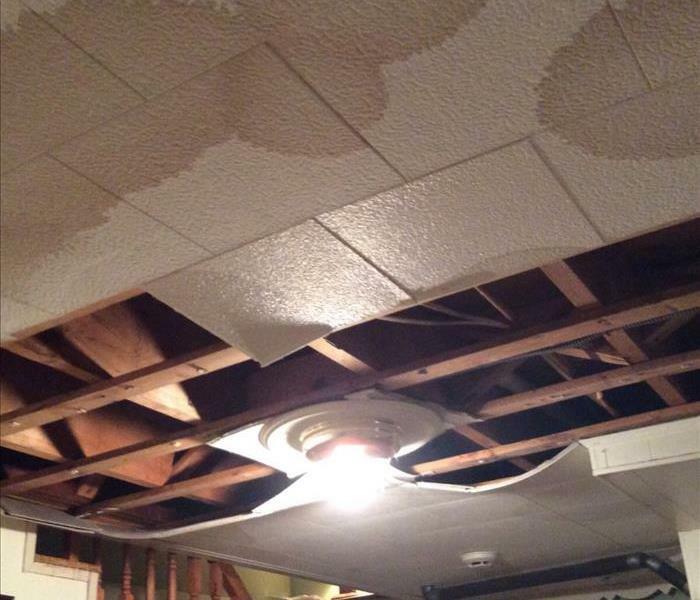 If your home has been damaged by severe floods or storms, call us right away at 978-688-2242. 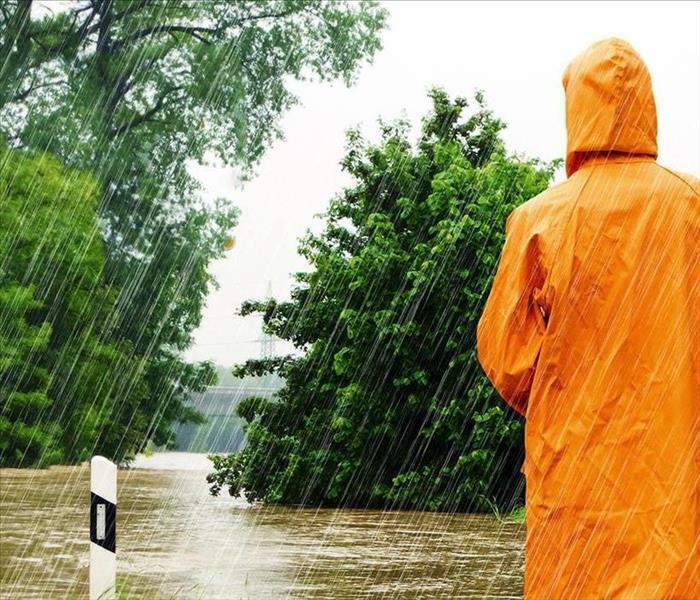 Disaster can strike when we least expect it, but SERVPRO of Lawrence will be there to help you weather the storm. This Dracut, MA family discovered extensive microbial growth in their home, thanks to a pipe break that went undetected for months. 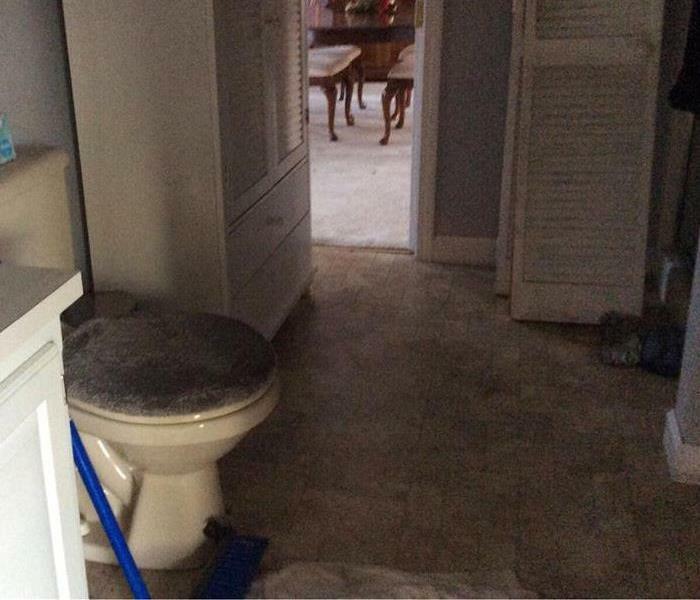 Believe it or not, mold problems like this can be mitigated with the right expertise and equipment. 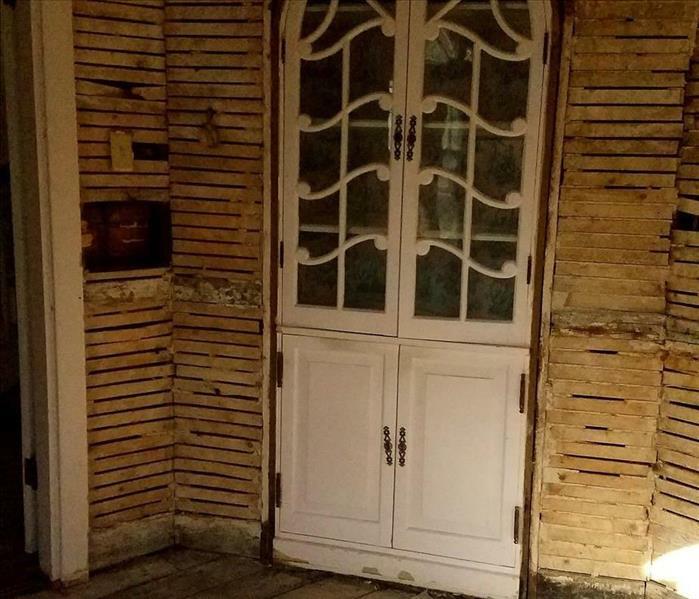 SERVPRO of Lawrence has trained technicians that were able to test and remove the mold growth, and then restore the space to pre-loss conditions. The family was very grateful that we were able to recover their home and protect them from any potential health effects. 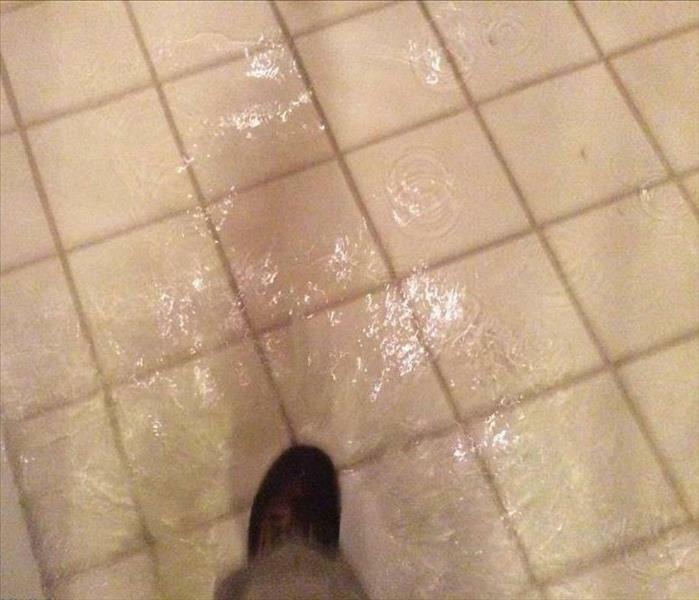 While flooring and walls may look unharmed, it is the water that you don't see that can cause the most problems. Water that sits for longer than 48-72 hours can start growing microbial growth. Here at SERVPRO of Lawrence we use special meters to detect water underneath the surface. 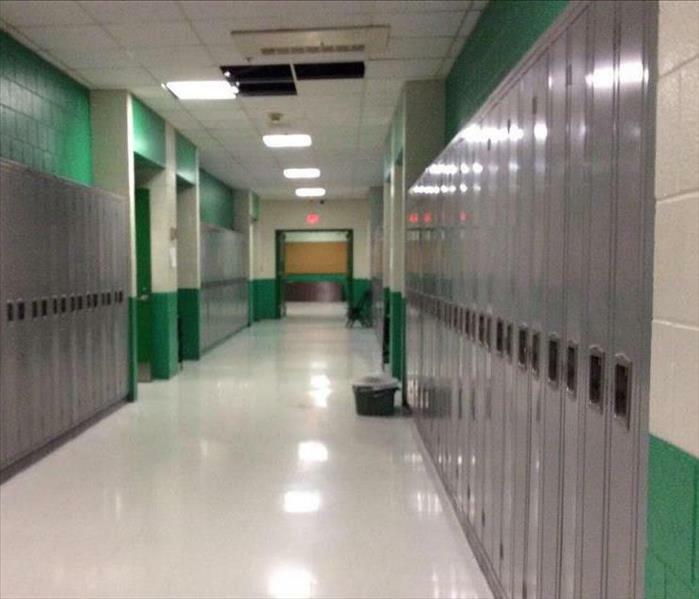 It's the middle of the school day, and all of a sudden there is water everywhere. What can you do? 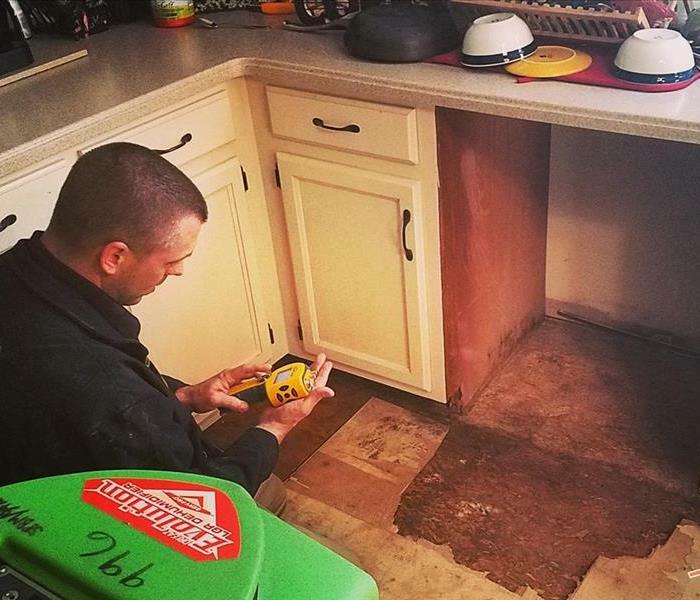 The best thing, is to call SERVPRO of Lawrence right away to remediate the situation immediately. Knowing who to call when water starts seeping in can help keep the stress levels down. Also, knowing that SERVPRO of Lawrence is available 24/7 for you is a great resource! 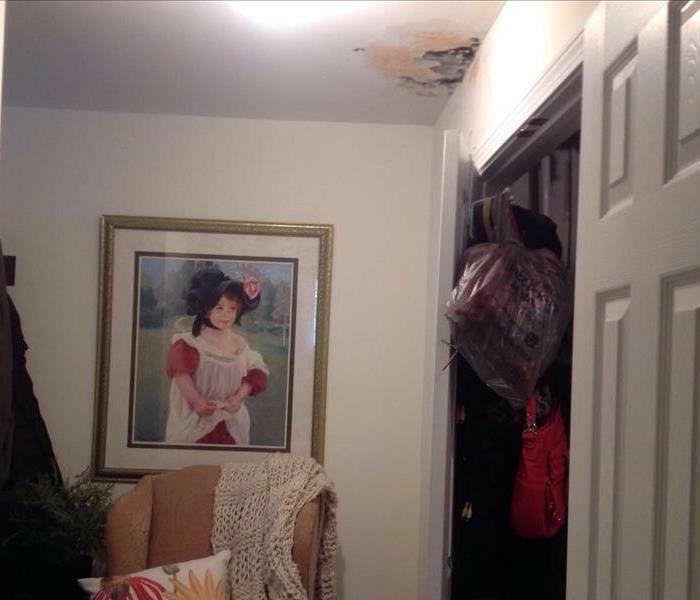 This family’s Methuen home suffered serious damage after a rain storm. Thankfully they called SERVPRO of Lawrence and we were able to help them and several other Andover families clean up debris and restore the property to pre-loss conditions. The homeowners were grateful that our 24/7 services were available to them in their time of need. 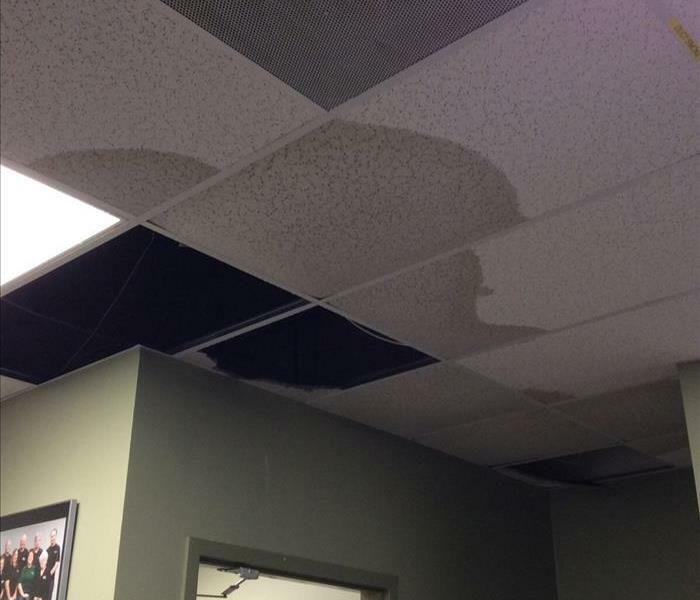 This photo represents water damage from a pipe break in a commercial building. 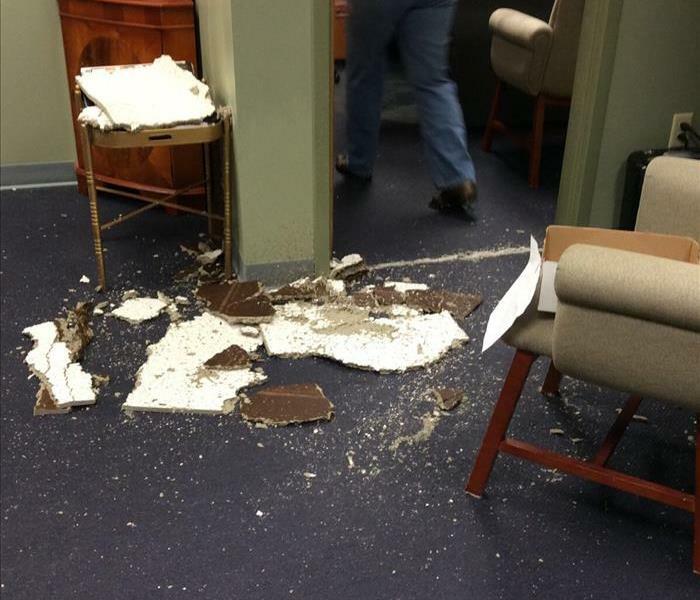 Water came through the ceiling affecting the tiles, insulation and flooring. SERVPRO of Lawrence came in and removed all fallen debris and affected tiles still remaining. 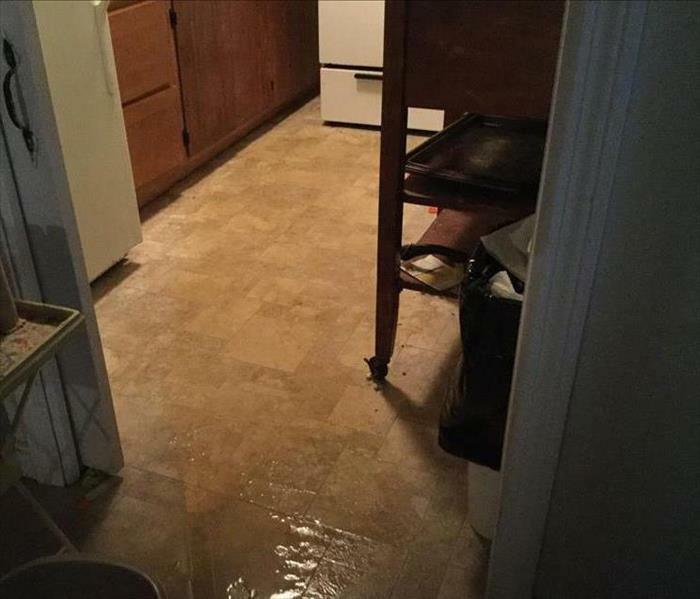 After extracting any other water, disinfecting the area, and drying down, the customer was happy to have their contractor come in to return them to "Like it never even happened." 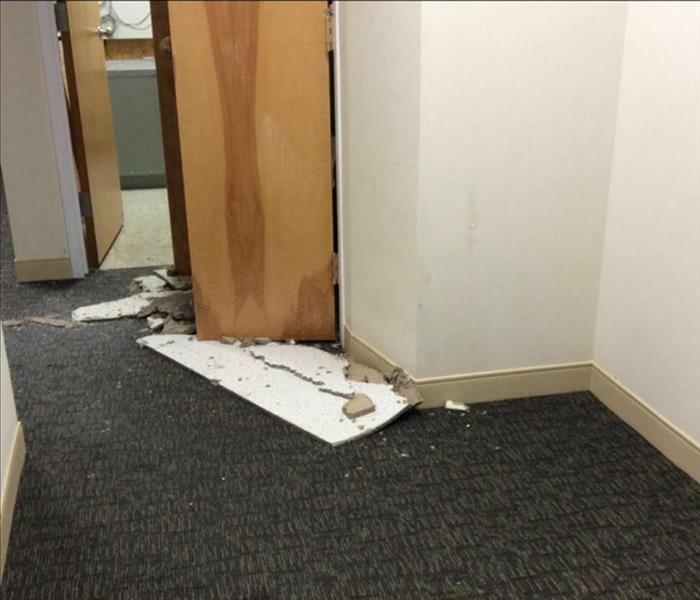 This photo represents water damage from a pipe break in a commercial building. There was standing water and fallen debris. We cleaned and disinfected all areas. 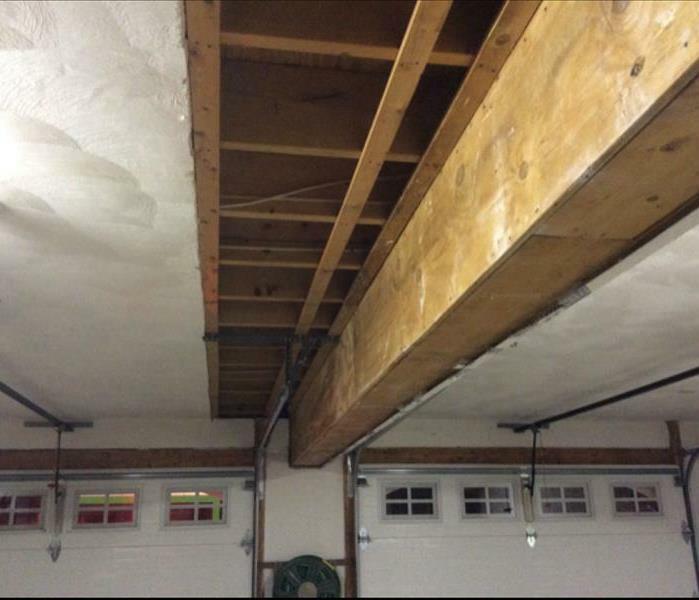 The customer was very happy that we provided all necessary measures to prevent mold. 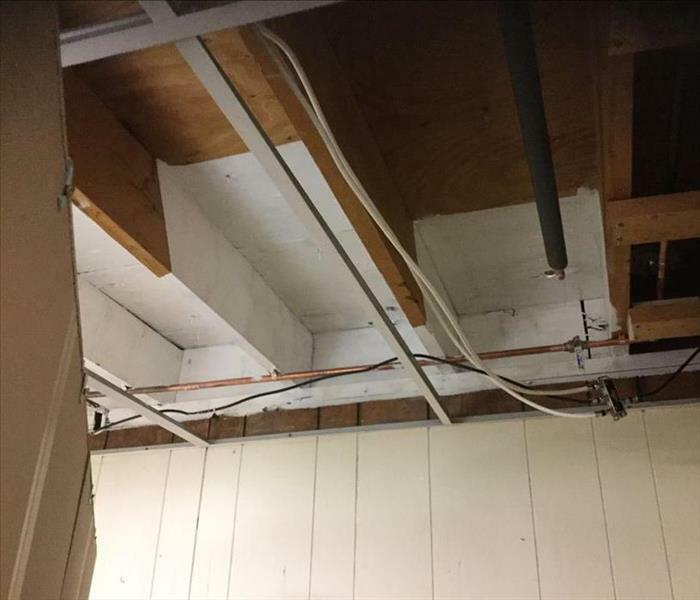 During a water remediation in this Dracut home, our technicians had to remove a damaged cabinet. In the process they discovered mold between the cabinet and wall. 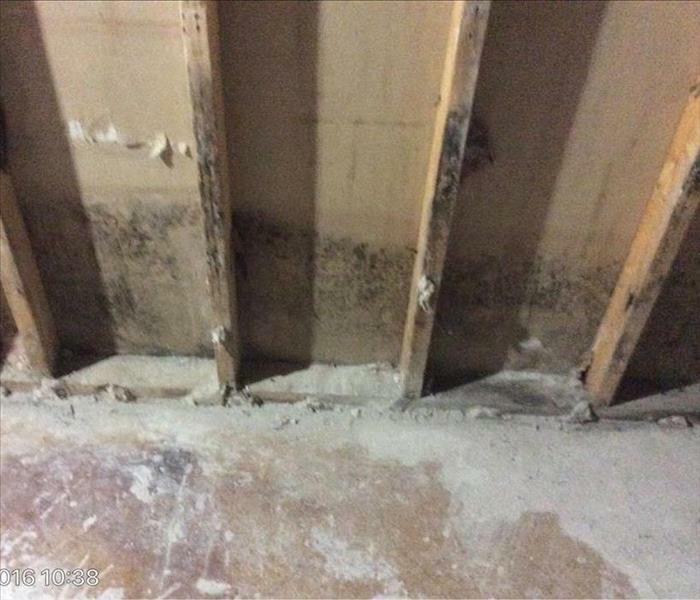 Microbial Growth can potentially start to grow within 48-72 hours of the water damage. It is important to call your local SERVPRO as soon as you see damage, so we can remediate the situation and try to prevent any growth. 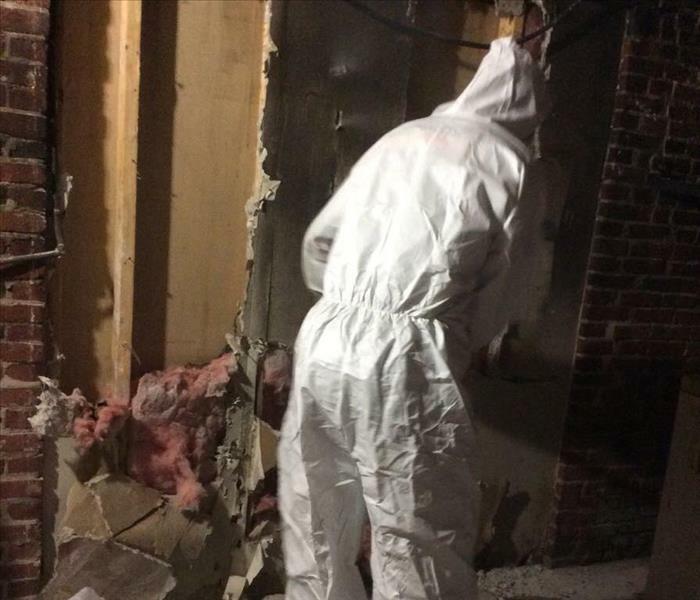 After mold remediation is completed, our technicians seal the area with encapsulant. 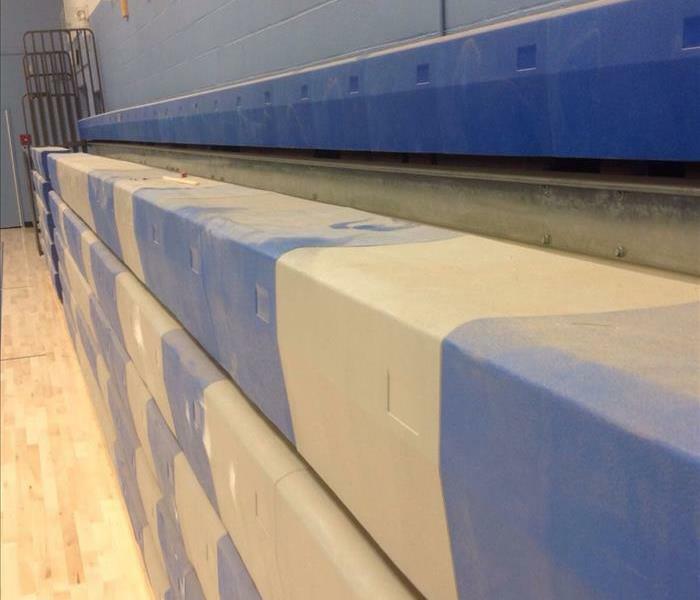 The white paint will take care of the staining that mold can leave behind. If our technicians have had to remove drywall and insulation to get to the mold, they can then cover it with plastic to protect the wall. Sometimes a fire damage involves more than just cleaning. 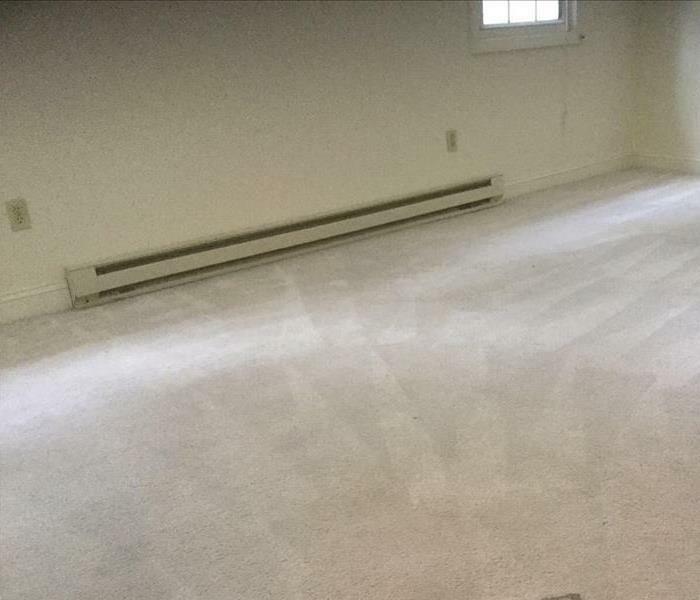 When it is more than smoke or soot damage, we are able to remove the damaged areas. This allows for your contractor to come in and put your home or business back together. 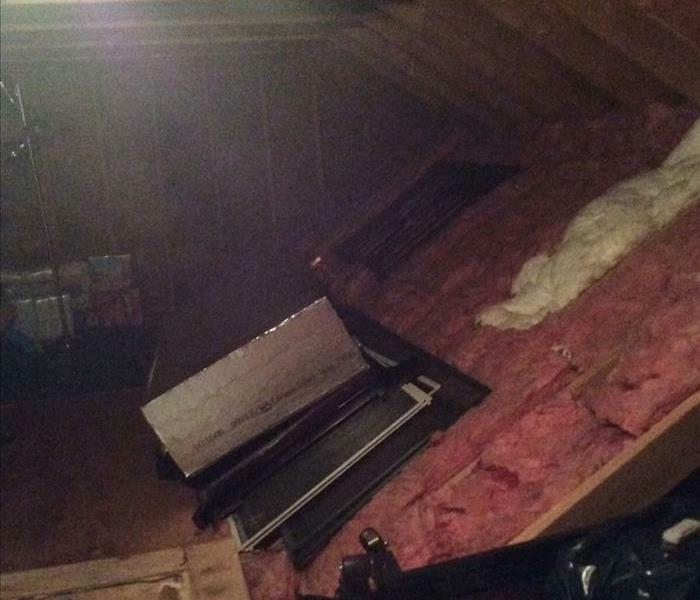 This Lawrence, MA family discovered extensive microbial growth in their attic. 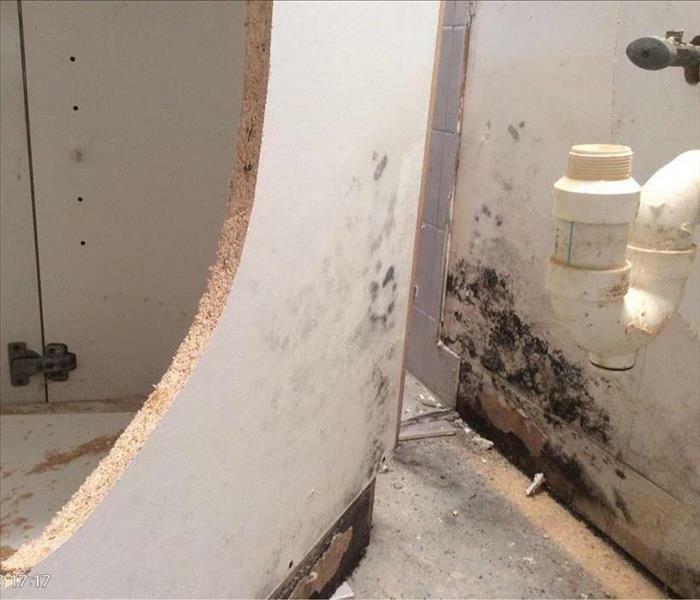 Believe it or not, mold problems like this can be mitigated with the right expertise and equipment. SERVPRO of Lawrence has trained technicians that were able to remove the mold growth, and then restore the space to pre-loss conditions. The family was very grateful that we were able to recover their home and protect them from any potential health effects. When we visit your home after a fire loss, we will scope the affected areas to determine the extent of the loss. We will always pretest affected surfaces to determine the type of smoke and which products will help us recover the area most effectively. We have the equipment, expertise, and experience to restore your fire and smoke damage. If a fire has damaged your business, call us right away at 978-688-2242. SERVPRO of Lawrence will treat you with empathy and respect, and your property with care. This Lawrence home suffered from a fire. 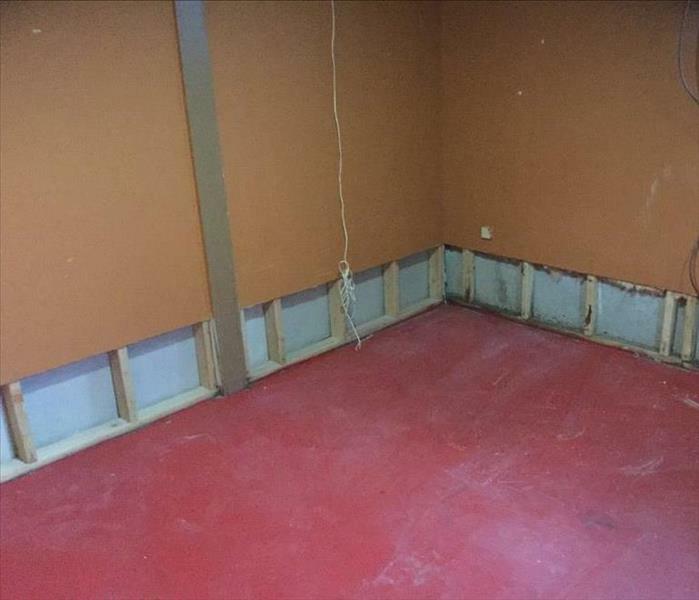 SERVPRO of Lawrence worked around the clock to remediate the problem, so that the rebuild process could be started as quickly and seamlessly as possible. During the process of extinguishing the fire, water can enter the home, causing debris to fall and wet materials. SERVPRO® Franchise Professionals can clean and deodorize your home back to pre-loss condition. We know how costly and devastating a fire can be to a building owner, so it is always our goal to get you back up and running right away. This kitchen was in need of professional cleaning with years of build up. 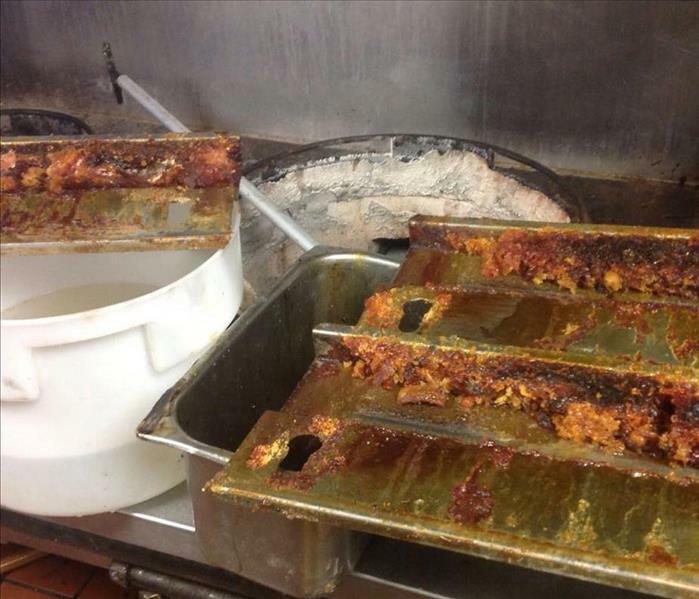 Everyday use and cleaning can not always take care of the grease and grime. 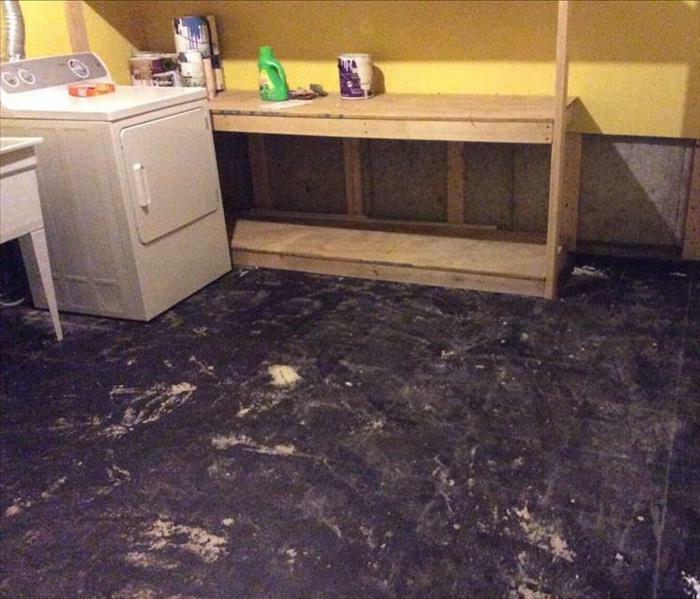 SERVPRO of Lawrence worked diligently to restore the affected area to its original condition. We know that commercial cleanings can cost a business thousands of dollars in productivity if the health department gets involved so it is always our goal to help keep your business running as flawlessly as possible. Not only the production staff is trained in our office. 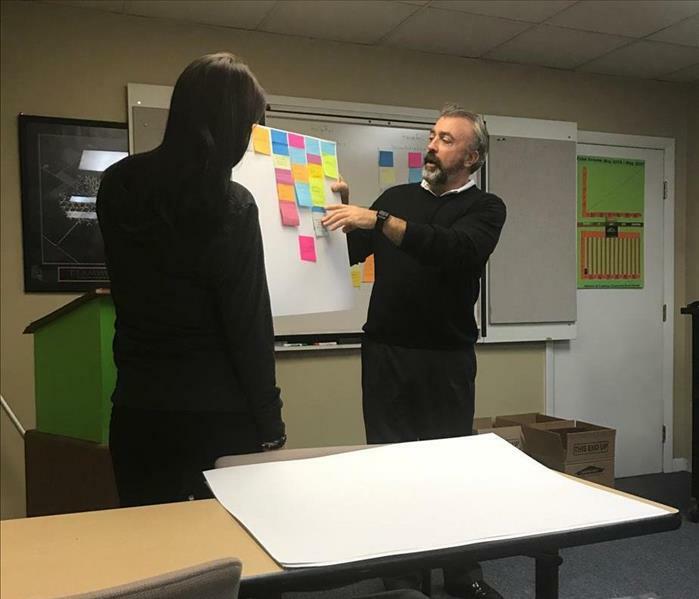 Marketing, managers, and the office administration are always learning the most effective ways to grow our business, work with commercial customers, and provide the best customer service possible. We respond 24/7/365 to your fire, water, and mold damage cleanup needs and are always here to help. Our Production Technicians and Crew Chiefs are constantly trained on the most effective ways to work in our customer's homes and businesses in order to provide high quality service and restore as the home as much as possible in any damage. While working a customer's home, we try and use a containment to accomplish two goals. The first is to create a drying chamber that focuses the equipment and drying plan to the area that was affected. Secondly, when demo is part of the drying plan, we aim to limit the dust throughout the rest of your home as much as possible. Using these containments provide a better experience for our customers, and help make it "Like it never even happened." The lingering soot after a fire in Lawrence, MA can cling to surfaces. Shown here is the soot on a baseboard heat unit. 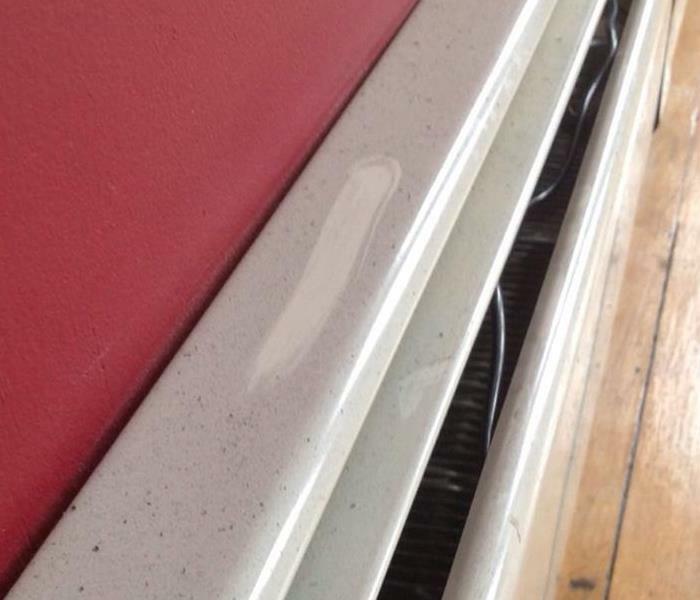 If not treated in a timely and proper manner, it can damage the paint and varnish in a home. It can cause future damage. We clean the exterior and interior of all units during the restoration process. This can prevent secondary damage and odors from permeating the home. 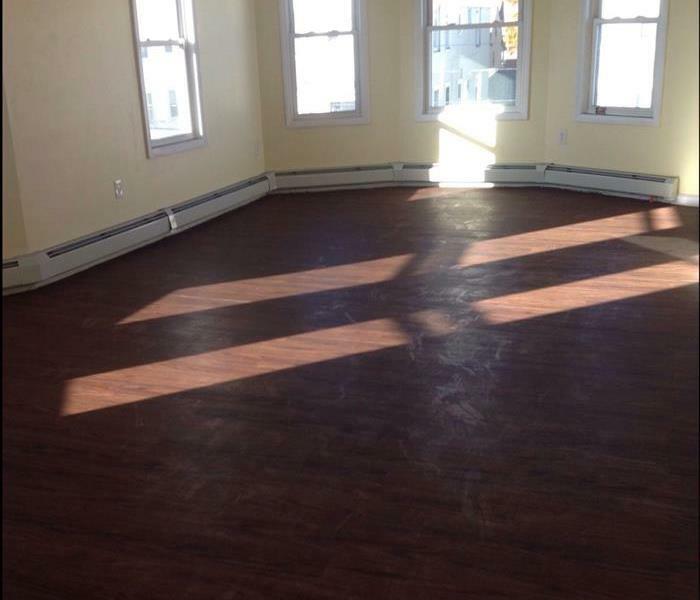 In this home, there was a leak from the floor above. 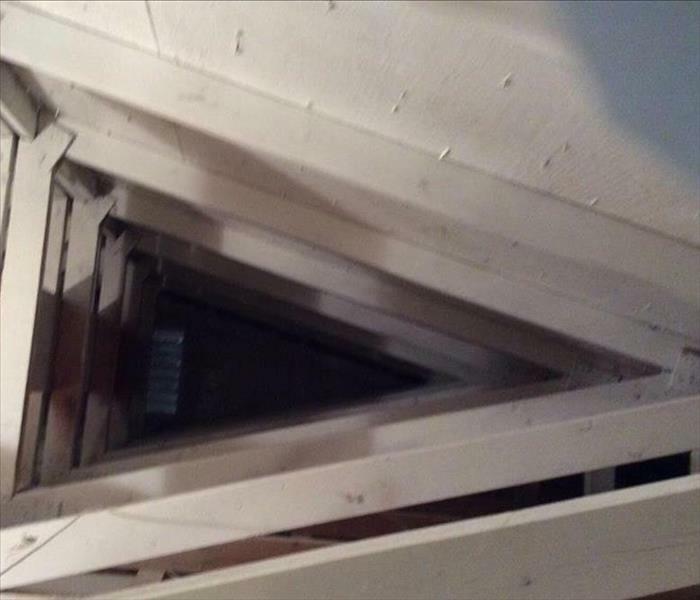 It traveled through the floor and the basement ceiling. 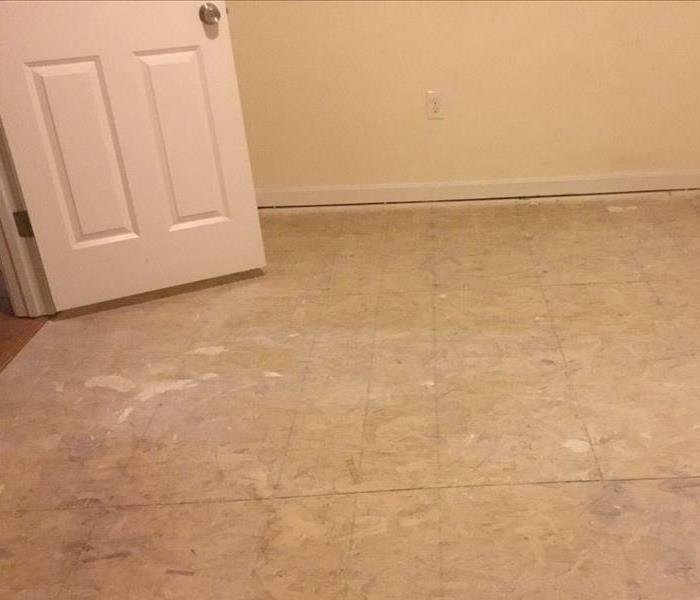 We removed damaged tiles, cleaned the affected area, and disposed of all debris. We worked as fast as possible to make it "Like it never even happened."